The sun not only causes damage to you hair, but if you color it, it can also cause the color to fade. The sun combined with the chemicals in hair dye dries hair out immensely. Drinking plenty of H2O can keep the body and hair moisturized, but sometimes you need a little extra help. Kiehl's has a great product for that. 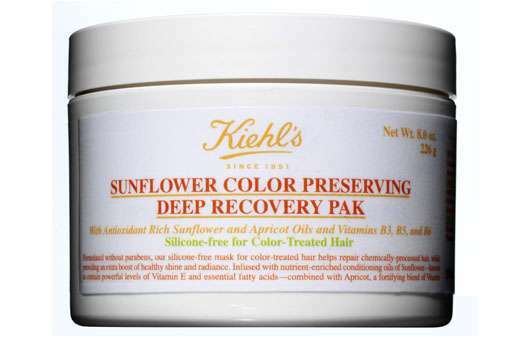 It's called Sunflower Color Preserving Deep Recovering Pak ($26). It hydrates your hair while preventing the color from fading. This conditioner contains Sunflower oil and Apricot Kernel oil to help not only prevent damage, but also repair what's been done. If you like the treatment you'll probably also like their Sunflower Color Preserving Shampoo ($18 & $28) and Conditioner ($19 & $30) . The Kiehls products contain natural ingredients and go a long way protecting the skin and hair.